POPin's unique live feed of your POPin results now will help you make sense of your report even easier with customization options. Toggle to the results section in the top bar of your POPin to view your report. Customize your settings by clicking the customize button the right-hand side of the top bar. Each section of your results will give you the ability to turn reporting off and on. You will also be able to rearrange your report in order of the pieces that are the most important to you. Use the toggle and arrows on the right hand corner of each section to turn it on and off or rearrange. Noteworthy allows you to select responses or comments that you'd like to highlight from your session. Click Edit at the top of the noteworthy box and select the comments or responses you'd like to show by simply clicking on them. Be sure to turn on the toggle to display Noteworthy selections in your report. Top 5 will show the top responses, ranked by the amount of activity, which is a combination of votes and comments. Statstics will give you the numerical totals from your session. 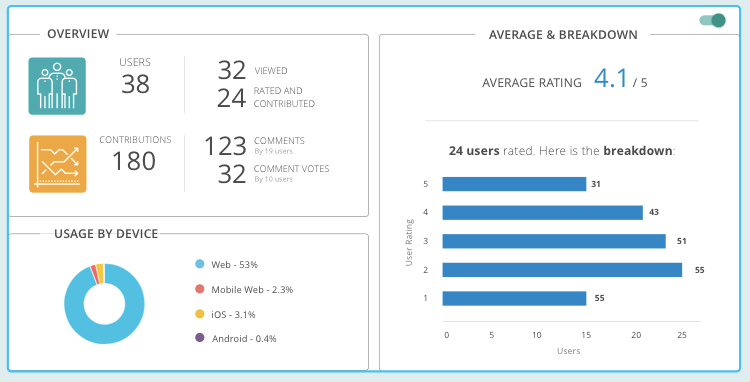 Users indicates the number of users who logged into your POPin question. This total is broken down by the amount of people who simply viewed your question versus the number who contributed. Contributed is defined as participated in some way, meaning a response, a comment or a vote. Contributions is the total number of responses, votes and comments. This number will be broken down by response, response votes, comments and comment votes. Usage by Device is a breakdown of the device that your users were on when they logged into your question. In scale or yes/no question, statistics will also include an average result as well as a breakdown of the voting. If your question is a repeating question, your statistics will also include a historical trend. POPin uses a unique formula to determine the average sentiment from the results of your session. This part of your report will indicate how many responses or comments have a positive, neutral or negative sentiment. Most popular will list all of your responses and comments from your POPin session, organized from the most interacted with (voted or commented on) responses to the least interacted with.